It’s hard not to feel anxious these days. So much barking and blinking and chest thumping. So much posing and strutting, and grinding, voracious greed. It’s mighty tough for a sensitive soul (prone to itchy bouts of worry) to cope with all the mishegas and mayhem of our overheated plugged-in 24/7 culture. Finding a little grace and respite amidst the noise can be hard. That is why I am sharing (another favorite) soup recipe. Just in case there is a kindred spirit out there in need of a bowl of creamy veggie comfort. 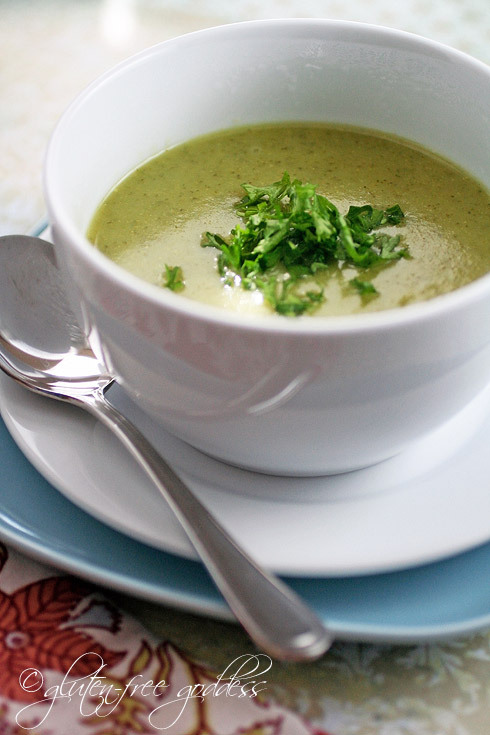 A gluten-free vegan detox soup worthy of Peter Rabbit’s sneaky excursions into Mr. McGregor’s garden (that mischievous little rabbit- or as we like to say in my house… BUNNY!- close to my own greens adoring heart). Bunnies aren’t known for twerking on YouTube, or tweeting out criticism, or bullying, or, in general, wreaking havoc. Unless you count Peter’s root vegetable stealing. Or (my sons’ childhood favorite) mischievous Max and his devouring love of chocolate chickens (have you read the Max books?) . Bunnies are (ostensibly, anyway) devoted to a milder temperament. And qualities like extreme cuteness. Shyness. And dare I say, gentleness. Traits easily trampled in our thundering, gun worshipping, zombie killing 3-D pyrotechnics fed culture. So it seemed only fitting I cook up a batch of bunny loving vegan soup today as fresh and non-toxic as could be. Creamy, green, good-for-you soul food. And body food.